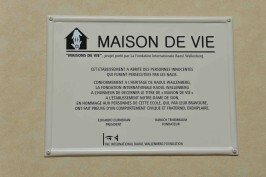 Plaque in Notre-Dame Institute of Sion. Paris. 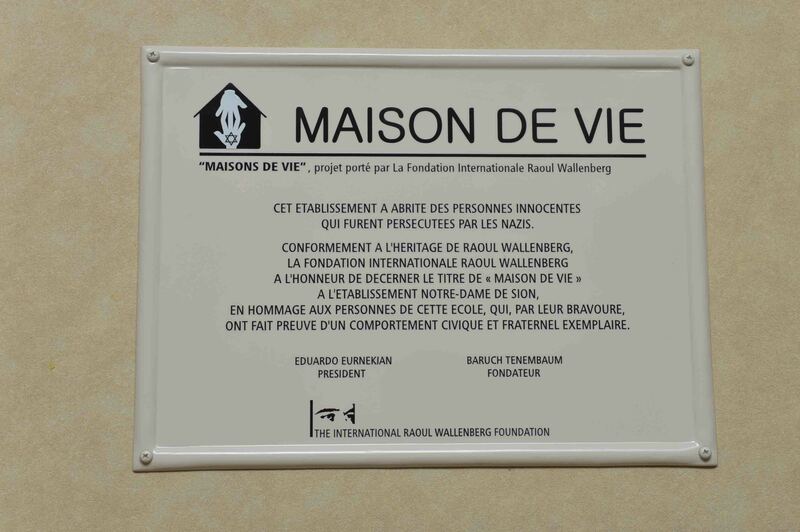 Upon proclamation, the Houses of Life are easily recognizable by means of a special commemorative plaque which is affixed at the façade of the building, attracting numerous passers-by, visitors and tourists and raising awareness to the deeds of the rescuers. During the Holocaust, many countries under Nazi occupation offered refuge to innocent victims of the Nazi extermination machine. In most of the cases, they were children left by their parents who were facing deportation to concentration and death camps. In less than 2 years since the inception of the project, more than 300 Houses of Life have been positively identified. Some of them were already officially proclaimed as such, mainly in Italy, France and Greece, and the numbers are growing by the day. The majority of Houses of Life are Catholic Churches, Convents, Monasteries and Boarding Schools, but also Protestant Convents, residential houses have a place of honor in the list. In some instances, like the tiny Greek island of Ereikousa, the whole population as a collective was involved in the life-saving sheltering feats. May 10th, 2016, at the Convent of Santa Lucia, at Lastra a Signa, which during the war offered shelter to Jews and to non-Jews. September 9th, 2016 – at the Catholic American University of Rome, which in the days of WWII housed the Convent of Nostra Signora de Zion, which served as refuge to many Jews, thanks to Mother Maria Augustina and Maria Agnese. Cardinal Kurt Koch will attend the ceremony. At a date to be determined, at the San Gioacchino in Prati, which sheltered some 40 Jews in the attic, under the good care of Father Antonio Dressino and others. At a date to be determined, to the whole Town of Tagliacozoo, which collectively saved a Jewish family. At a date to be determined, at the Istituto San Leone Magno of the Fratelli Maristi, which sheltered some 20 children and some adults, under the good care of Father Alessandro Di Pietro. At a date to be determined, at Congregazione Pie Operaie di San Giuseppe, Florence, which sheltered a number of Jews under the good care of Sister Maria Agnes Tribbioli. At a date to be determined, at the Batiment AAA – Mistral in Liege, formerly house of the Convent of S?urs de la Misericordie, where Jewish girls were sheltered under the good care of Sister Veronique Overkamp. At a date to be determined, at the Couvent des Clarisses in Nice, which gave refuge to many children under the good care of Mother Superior Anne-Marie. At a date to be determined, at the Oratoire de Louvre, in Paris, a Protestan Convent which gave shelter to many Jews during the Holocaust. At a date to be determined at the Provincialis Jesuites, Budapest, some 150 Jews were sheltered under the protection of Father Jacob Raile. At a date to be determined, at the Church of All Saints, Warsaw, whose Parish priest Fr. Monsignor Marceli Godlewskisheltered helped many Jews and others to escape.